A boy had to be airlifted to hospital after being scalded by boiling water at a railway festival. Organisers Llangollen Railway said an investigation was under way after he was "badly injured" at Carrog railway station, Denbighshire, on Saturday. 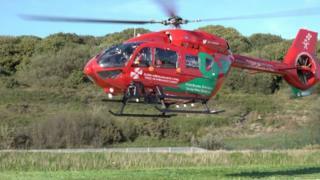 The boy was taken to Alder Hey Children's Hospital in Liverpool by air ambulance for treatment. Organisers said volunteers were "extremely upset" by the incident, but thanked those who helped the child. It is not yet known how the boy was injured.